As part of our ongoing commitment to our clients to bring them the latest trends in the hospitality market, today we are introducing our brand new 8ft scaffold dining tables which complement our existing scaffold high tables which have already proved to be hugely popular. 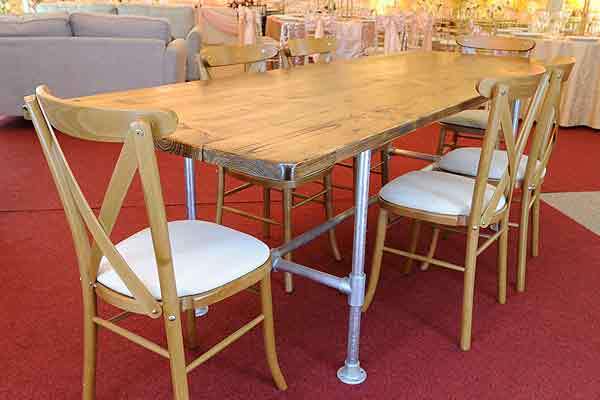 Made from reclaimed timber and polished scaffold poles, these scaffold dining tables offer event professionals something different to the norm for their event banqueting and dining occasions. The choice of chairs to accompany the table is of course yours, and you can choose from our extensive range of chairs here online at Event Hire UK. Our suggestion, however, is that our cross back chairs look great as a match-up to this table, and we have these cross back chairs available in large quantities to be able to service multiple large events at any one time. When it comes to event furniture hire across the UK, few companies are able to compete with the range, quantities and service from the experts at Event Hire UK. Browse our range online today and make your secure hire, safe in the knowledge that you are working with the furniture hire UK experts.